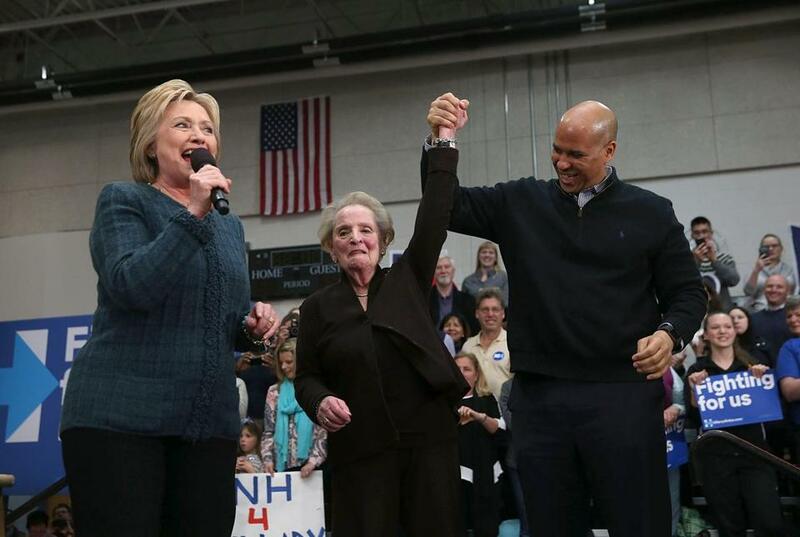 From left: Hillary Clinton, former Secretary of State Madeleine Albright, and US Senator Cory Booker of New Jersey participated in a get-out-the-vote organizing event Saturday in Concord, N.H.
NEW YORK — Hillary Clinton’s older feminist supporters have a message for young women who are not backing her candidacy: Shame on you. Women were expected to help power Clinton to the Democratic nomination, but as she struggles to overcome a tough challenge from Senator Bernie Sanders, her support among them has been surprisingly shaky. Young women, in particular, have been drawn to the septuagenarian socialist from Vermont, and the dynamic has disappointed feminists who dreamed of Clinton’s election as a capstone to the movement. Two feminist icons of Clinton’s generation made their frustration known over the weekend, calling on young women who view Sanders as their candidate to essentially grow up and get with the program. While introducing Clinton at a rally in New Hampshire on Saturday, Madeleine Albright, the first female secretary of state, talked about the importance of electing the first female president. In a dig at the “revolution” that Sanders often speaks of, she said that the first female commander in chief would be a true revolution. And she scolded any woman who felt otherwise. Supporters of the former secretary of state see the overwhelming campus enthusiasm for Bernie Sanders as naïve. Clinton laughed, slowly clapped her hands, and took a large sip of her beverage. In an attempt to explain Clinton’s struggles with female voters in New Hampshire, Albright said during an NBC interview Saturday that women could be judgmental toward one another and that they occasionally forgot how hard someone like Clinton had to work to get where she is. Albright’s remarks were not the only instance of an older generation of feminists frowning on younger women who do not consider the potential election of Clinton a special moment. Gloria Steinem, one of the most famous spokeswomen of the feminist movement, took the sentiment a step further Friday in an interview with talk show host Bill Maher. Explaining how women tend to become more active in politics as they become older, she suggested younger women were just backing Sanders so that they could meet young men. “When you’re young, you’re thinking, ‘Where are the boys? The boys are with Bernie,’ ” Steinem said. Many female supporters of Sanders’ took issue with the remarks on social media, and Steinem’s comments, along with those of Albright, could set off an intense debate within the feminist movement. For many older women, Clinton represents the final and best chance to send one of their own to the White House, while young women think that should not be a decisive factor. With backlash growing, Steinem issued an apology for her comments Sunday morning. According to a USA Today/Rock the Vote poll, Democratic and independent women ages 18 to 34 prefer Sanders to Clinton, 50 percent to 31 percent. In her 2008 campaign, Clinton played down the history-making nature of her candidacy. But this time, she brings it up regularly. The music at her rallies often rings of women’s empowerment, and she frequently discusses the meaning of being a grandmother. During her debate with Sanders last week, she pushed back against his suggestion that she was “establishment” by reminding voters that her election would signal the end of a long road for women. 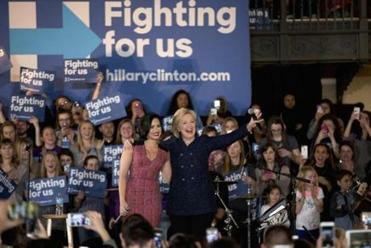 Clinton’s campaign has recruited young female celebrities like Lena Dunham, creator and star of the HBO show “Girls,” and singer Demi Lovato to build a following among millennial women. Even young women who would like to see a female president elected someday do not necessarily want to base their vote on that single factor. At a rally for Clinton in Iowa in late January, Jaimee and Matthew Warbasse brought their 7-month-old daughter to see the candidate who could become the first female president. Women’s rights were so important to them that they named their child Emmeline, after British suffragist Emmeline Pankhurst. Still, Jaimee Warbasse said she was unsure that she would support Clinton, as she also found Sanders appealing.